Fall Jefferson is this coming weekend, Friday, Saturday and Sunday. 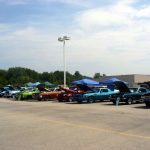 Show cars (Fords are being featured) will be on Saturday and Sunday. The gates open at 10AM on Friday for vendor set-up and paid spectator purchasing.